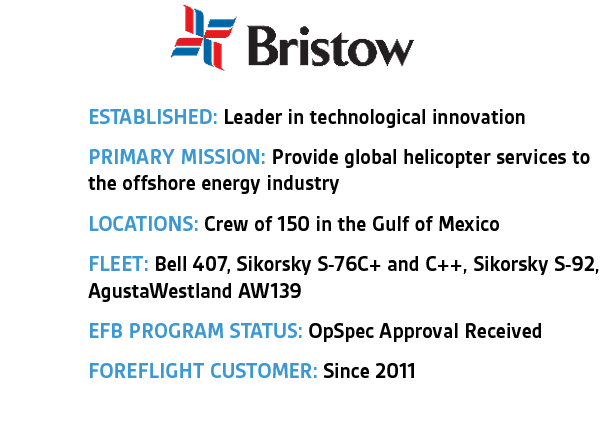 With over 60 years of operation under its belt, Bristow Group is a leading provider of helicopter services to the worldwide offshore energy industry. Bristow employees take pride in being leaders of innovation, pioneering technologies that move the industry forward, including Health Usage Monitoring Systems (HUMS) for rotorcraft, helicopter flight data monitoring for legacy aircraft, and an integrated global satellite tracking system. ForeFlight has been the gem of our EFB program. 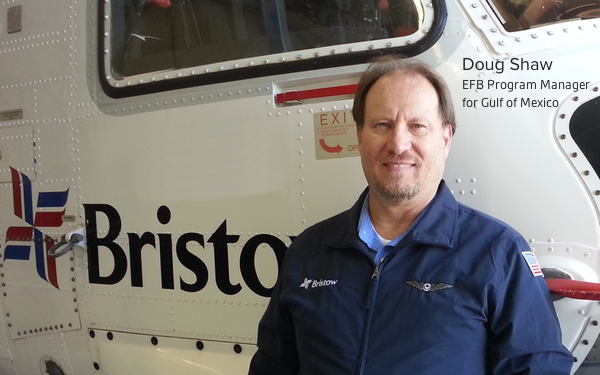 We caught up with Doug Shaw who helped deploy and manage the EFB program for Bristow’s Gulf of Mexico operations for the last five years. Doug has been in the helicopter services industry for over 32 years and has firsthand experience with using advances in technology to stay at the cutting edge of operational efficiency and safety. In general, how has technology shaped Bristow Group operations? I have always viewed Bristow as a leader in the development and deployment of advanced technology. Bristow was the very first operator to develop and deploy Health Usage Monitoring Systems (HUMS) aboard rotorcraft. HUMS is a system that uses various sensors and accelerometers to measure vibrations on the primary components: gearboxes, engines, anything with a bearing and a gear. These sensors are mounted on the airframe and detect vibration levels in the aircraft based on the moving components to determine when a gear is wearing out to the point where it may fail soon. The data is analyzed and as long as the vibrations are below thresholds set by the manufacturer, then that tells us that all these gears in the aircraft are moving smoothly. As they wear they create metal fragments, the vibration levels start to go up, and then we can actually determine when a component is going bad and remove it prior to a failure. There are a lot of companies now that are using HUMS. We pioneered it and proved the technology in the North Sea, long before anyone else even thought of it, and now it’s become a required system onboard aircraft to make sure that everything runs safely. We had a number of key objectives, including enhancing our oversight of operational control, reducing the physical storage space and weight of carrying paper flight documents, and performing fast, simple performance calculations even while in flight. We also had a few objectives related to document distribution, such as unlimited availability of required flight documents, the ability to quickly implement updates to all documents and ensure documents are current, and providing our crews with a simplified way to locate specific documents in flight. One challenge we faced is quickly updating the manuals used by our maintenance staff. Prior to EFB, there could be a delay before information was added to the manual. We also wanted to get updates out to the pilots faster. Using ForeFlight and our own Bristow library, we can quickly ensure our pilots have an updated manual. Within 15 minutes, we can publish new information to the cloud and the pilots can view it on their iPads. We have all of our flight related documents — flight manuals, minimum equipment lists, aircraft supplements — on both ForeFlight and the Bristow library, which ensures that our pilots always have the documents they need. In the Gulf of Mexico, ForeFlight is the preferred tool to view these documents and is our number one document source, with the Bristow library as the backup. In regards to using an EFB, what capability has made the most impact on your operations? By using ForeFlight, we have been able to eliminate the IFR flight bags from the cockpit, which weigh about 30 lbs. Not only does this provide a cost savings, it allows us to carry an extra 30 lbs. of fuel, baggage or other needed items. We’ve also been able to eliminate paper trip kits when we ferry aircraft. 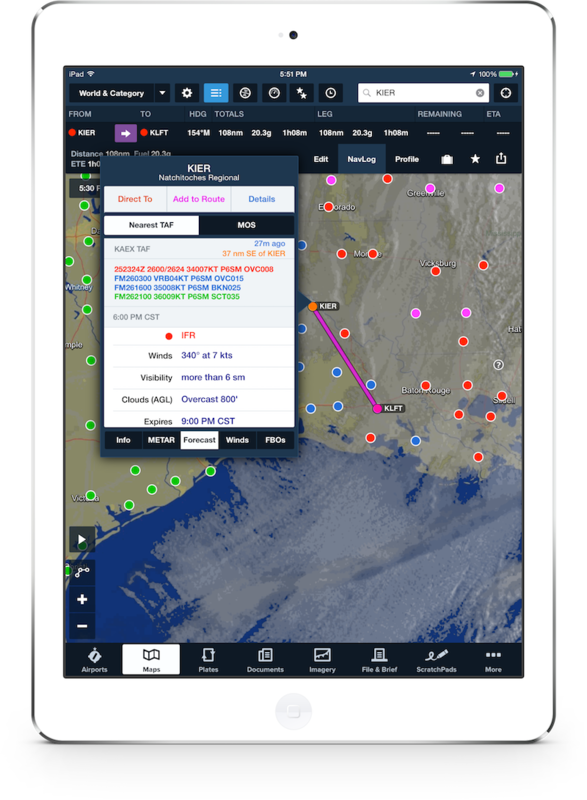 ForeFlight has provided live weather to flight crews on the ground for critical decision making. It has simplified the filing of IFR flights into the Gulf of Mexico and it enhances our situational awareness. In addition, ForeFlight has provided a backup to our flight crews for all Bristow documents in our Library. It's hard to identify one particular instance because ForeFlight has become such an integral part of all day-to-day flight operations in the Gulf of Mexico and has become critical to our operation. The first thing our pilots do when they get on the base is sign in, check the available NOTAMs, go out and preflight their aircraft, make sure everything works the way it’s supposed to, come back in and start flight planning. The moment they start flight planning they open up ForeFlight because it gives them such a large resource of weather. Once we figure out where we’re going, we can file a flight plan. If we’re going to fly IFR because of stormy offshore conditions—which doesn’t occur often in the Gulf of Mexico—ForeFlight allows us to file easily. We have 150 pilots that have reported that ForeFlight makes it a whole lot better when filing IFR. The updates for all of our charts, which normally occur on a 14- to 28-week cycle, are also very easy. We don’t have to worry about going through a paper manual, pulling out random pages and re-inserting random pages, we just tap the update button and everything is current. Then you throw in the documents that we use—the RFMs, the supplements, the minimum equipment lists—those are updated at the same speed as the charts. It has become an extremely valuable tool in the Gulf of Mexico for all of our crews. What advice do you have for other operators looking at deploying an EFB program? Strictly follow the Advisory Circular from the FAA, as it is a perfect checklist. That’s what we did when we created our EFB. We knew that our POI in Baton Rouge was going to come in and use the 8900.1, which is based on the Advisory Circular, to basically go through our program and approve it. There is a checklist in this Advisory Circular, and if you go through and you satisfy all those individual items in your program and you have procedures in place to satisfy all of those line items, then the FAA should approve you. I wrote the EFB procedures manual that was reviewed by the FAA and approved. What we saw in the requirements of the Advisory Circular guided us as far as what we had to address in our manual. A lot of people get confused when they read the federal regulations. But if you understand how to read them, and you have experience reading them, they’re not that difficult. And being Bristow, we always comply with regulations.